Timing is everything: In which an intimate relationship turns out to be rather one-sided « Nothing in Biology Makes Sense! Orchids have some of the most remarkable pollination relationships of all the flowering plants. Their flowers are adapted into wild shapes for placing packets of pollen on precisely the right part of a pollinator’s body, and many species attract pollinators with lures that are somewhat kinkier than simply offering nectar—such as mimicking a female pollinator’s scent and appearance, to dupe males of the species into, er, making intimate contact. 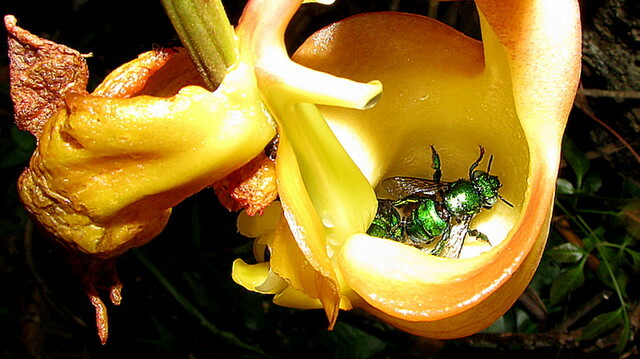 A somewhat less exploitative orchid-pollinator interaction involves offering scent compounds to euglossine bees. Male euglossines collect scents from their environment—things that smell pleasant to humans, as well as things that really don’t—in special structures on their legs. It’s thought that they use the collected scents to attract females. Three large, diverse groups of orchids transport pollen by generating bee-attractive scent compounds, then saddling any bee who comes to collect the scent with a packet of pollen. From the outside, this looks like a mutually beneficial relationship. The bees get their perfume, the orchids a pollen transporter. Over millions of years, such an interaction should lead bees and orchids to diversify together—when one orchid species splits into two, the bees that collect scent from them might very well speciate with the orchids. A recent paper in Science provides pretty good evidence that, over the long history of euglossines and the orchids that perfume them, the interaction hasn’t worked like that at all. The study by a team out of Harvard—lead-authored by Santiago R. Ramírez—tests three predictions arising from the proposition that bees and orchids are equally dependent on the scent-collection mutualism. First, as I noted above, a mutually-dependent relationship should mean that bee and orchid species often form in tandem, and that the euglossine bees and the orchids have spent most of their histories together. Second, the euglossines should rely mainly on scents from orchids, not from other sources. Finally, euglossines and orchids should show similar degrees of dependency. An orchid that relies on only one bee species should use a bee species that only collects scent from that one orchid; bees that collect scent from multiple orchids should use orchids that are, themselves, involved with multiple bee species. 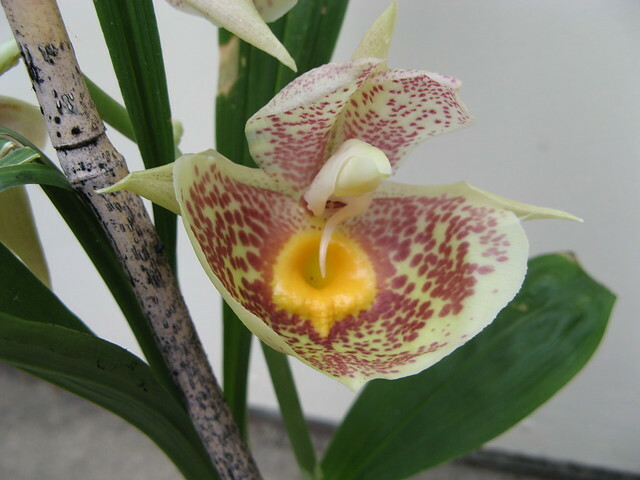 Catasetum, a member of one of the orchid families examined by Ramirez <i>et al</i>. To test the first prediction, the coauthors reconstructed evolutionary relationships among the euglossine bees, and within three families of scent-producing orchids. They used these phylogenies to estimate the age of each of the four groups—that is, how long ago the common ancestor of each group most likely lived. If the bees and the orchids diversified in tandem, the four groups’ common ancestors should be about equally old. However, the bees turned out to be older, as a group, than the orchids. The euglossine bees originated about 35 to 40 million years ago; none of the orchid families has a common ancestor dating further back than 30 million years ago. Next, the team inventoried scent compounds collected by the bees, and compared them to scent compounds produced by the orchids, or by other sources in the bees’ environment. The found that only a small portion—12 of 585 identified compounds—are produced exclusively by orchids. Lots of scents produced by bee-attracting orchids are available from other sources as well. That suggests the orchids are taking advantage of what bees already want, rather than producing scents the bees have come to rely on from interaction with orchids alone. Finally, there’s the patterns of relative specialization in bee-orchid interactions: it’s pretty one-sided. Orchids are more likely to rely on a single bee species than bees are to visit a single orchid. In a set of “co-extinction” simulations, the authors took the list of which orchids interact with which bee species, and randomly deleted species of plants (or pollinators), then checked to see how many pollinators (or plants) were left without a partner—and partner-less species were considered “extinct.” Randomly deleting bee species caused the orchids to go “extinct” from the list significantly faster than randomly deleting orchids caused bees to go extinct. All three lines of evidence here suggest that, far from diversifying together, euglossines and the orchids they pollinate are in a distinctly one-sided relationship. Euglossine bees were already diversifying, and probably collecting scents from the environment around them, when the orchids “discovered” that they could hire the bees to move pollen for the price of the right perfume. Millions of years later, the orchids don’t produce anything close to all of the scents that the bees collect, and orchid species seem to be more dependent on individual bee species than the reverse. In short, there’s good reason to think that this apparently mutually-dependent relationship just isn’t. This entry was posted in coevolution, pollination and tagged euglossine, orchid, phylogenetics.